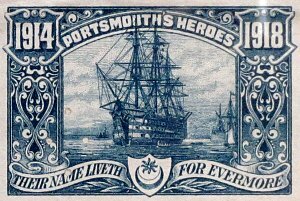 Over 6000 men and women with connections to Portsmouth died during World War 1. 5000 of them are remembered on the Cenotaph in Guildhall Square, more are on other WW1 memorials in Portsmouth; some only appear on the pages of the Commonwealth War Graves Commission website and some are not officially remembered at all. This section looks at a cross-section of those 6000 lives, their families and backgrounds together with their service careers. Later, it will be expanded to include some of the fighting men who survived the war and a selection of those who cared for and supported those at the front. Further information about all the World War 1 memorials in Portsmouth can be found on our sister site Memorials In Portsmouth. GOLLOP, Ernest George, Ldg Victualling Asst.